Taskade is a very visual task management solution perfect for small and medium-sized teams working on short and long-term projects. It is a very impressive collaboration tool with its rich set of features that includes a daily/weekly task scheduler, real-time updates, video-conferencing capability, and more. With Taskade, users get a comprehensive task management software where everything is centralized and easy to access. It has a virtual workspace where every member of the team can create tasks or to-do lists as well as see all the tasks for the day and the rest of the week. Users can pick how they want to view their tasks and then tick a task to indicate that it’s accomplished. As more tasks get done and ticked, the progress bar fills up, displaying the team’s overall progress. It is a very simple task management tool, one that many people will find easy to use right off the bat. Real-time features such as chat and video conferencing allow for effective communication and productive collaboration, resulting in better results and faster time-to-delivery. Taskade lets you take it out for a lengthy test drive and enjoy many of its features without you having to subscribe to an account. All you have to do is use the software as a guest and enjoy many of its awesome features such as Unlimited Task Lists, Unlimited Collaborators, Team Chats, Due Dates, Video and Voice Calls among others. Being able to utilize Taskade allows you to immerse and really experience the software’s intuitiveness, ease of use, and versatility. The features that come with the free version are what you look for in a task management software, so you basically get a full idea of how Taskade fits into your work. And if you decide the software is not for you, then the best part is that you wouldn’t have to shell a single dollar. Taskade has a very neat dashboard that is easy to the eyes and simple to navigate. You can easily work around the display, being able to spot which tabs you need to click and access the information you want to see, such as your daily and weekly tasks, memos, notes, and reminders among others. 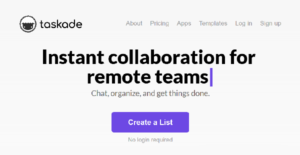 Among Taskade’s major selling points is that you can create an unlimited number of task lists and work with as many collaborators as you need. Even if you are using the free version. Whether you are working on a small-scale project or a huge enterprise-level endeavor, Taskade gives you that platform you need to make sure your tasks, priorities, schedules, and people are organized, assigned, and addressed. What Problems Will Taskade Solve? Work and chat together on the same page, same task list, same document. Since each company has specific business requirements, it is advisable for them to refrain from looking for a one-size-fits-all ideal software solution. Needless to say, it would be futile to try to find such a system even among market-leading software applications. The intelligent thing to do would be to catalog the various vital elements that require consideration such as main features, budget, skill levels of workers, company size etc. Then, you should do your homework thoroughly. Read some Taskade reviews and investigate each of the other apps in your shortlist in detail. Such in-depth research can ensure you discard ill-fitting applications and zero in on the app that provides all the elements you need for business success. How Much Does Taskade Cost? We realize that when you make a decision to buy Project Collaboration Software it’s important not only to see how experts evaluate it in their reviews, but also to find out if the real people and companies that buy it are actually satisfied with the product. That’s why we’ve created our behavior-based Customer Satisfaction Algorithm™ that gathers customer reviews, comments and Taskade reviews across a wide range of social media sites. The data is then presented in an easy to digest form showing how many people had positive and negative experience with Taskade. With that information at hand you should be equipped to make an informed buying decision that you won’t regret. What are Taskade pricing details? What integrations are available for Taskade? If you need more information about Taskade or you simply have a question let us know what you need and we’ll forward your request directly to the vendor.